Earn 1 point for every dollar you spend and use with the Martz Group! Martz Rewardz™ is a new reward program offered by the Martz Group where your loyalty is rewarded with points to be redeemed for your future Martz® travel. Call 570-821-3838 and a Martz Team Member will be able to assist in setting up your account and earning those points! Stop in and see your local Martz Group Ticket Agent. We always appreciate a personal visit! Well get you set up in now time so you can start earning points! Once you have signed up and have a valid account, the points will start rolling in. For every purchase you make, your account will show a running point total. You will earn 1 point for every dollar spent. Points are credited once the 1st ticket is purchased. For every dollar spent you will earn 1 point. Once you have earned 100 points, you have earned a $1 credit for future Martz Travel. Once awarded, points are available to use at any time either in the MARTZ terminal or online via the ticketing webstore. I do not have an email address. Can I join Martz Rewardz without using one? Unfortunately not. In order to take advantage of the Martz Rewardz program, you are required to have a valid email. Yes, Martz ticketing servers are housed in a level 1 PCI Compliant environment, which means your information is safe and secure! Can I earn Rewardz points at any Martz Location and on all purchases? Yes! Any purchases made towards Daily Service will be eligible for Rewardz. Do I need a (Martz Pass…do we have a name for this) to earn points? You do not need to have a Martz Pass to earn points, just a valid account. However, we strongly encourage you to consider using a pass. Here are some benefits of using the pass. Ability to purchase commuter packages online via desktop or mobile device. Saves you time! No more heading to the terminal on the weekend to buy tickets. You help the environment by reducing the paper needed. If you lose your pass, you can de-activate the card either by logging into your web portal or contacting a MARTZ customer service agent. What Martz Travel can I redeem my points for? Can I share my pool of points with another person? Martz Rewardz points cannot be shared and are tied directly to a single account. We may cancel the program at any time, providing you with a 60 day notice. You will not earn any additional rewards and you must redeem your current rewards balance within the the 60 day period or forfeit them.Once the 60 day period has passed, you’ll no longer be able to use points. When you use points to get rewards, you release Martz Group and all of its affiliates from liability for your use of points, for the reward and how you use it, and for your participation in the program. Martz Group is not responsible for replacing lost, stolen or damaged tickets or gift cards. We may refuse your request to use points if any of your Linked Card Accounts are not in good standing. These Terms & Conditions apply to your participation in the Martz Rewardz program. The program is intended to benefit individuals rather than companies. Business and Corporate Card Members may use points for any personal or business purposes they choose, but they can’t be directed or forced to use points for business purposes. It is considered fraudulent and abusive for Corporate Card Members to use a single Corporate Card account or rewards account for the purpose of accumulating points for company use. These Terms and Conditions replace all previous versions and are governed and construed under the laws (excluding conflicts of law provisions) of Pennsylvania. 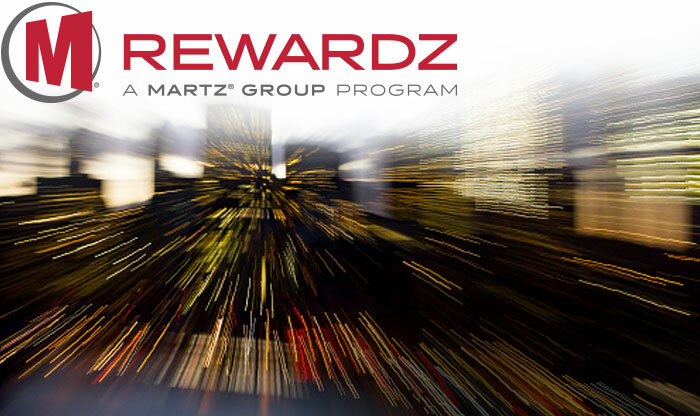 The Martz Rewardz program is owned and operated by Martz Group.